In a moment of inspiration back in 2001, an RN officer serving with the Thales CVF design team developing initial concepts for what became the Queen Elizabeth Class, hit upon the idea of separate islands. There are several advantages to this design but the most compelling reason for the twin islands is to space out the funnels, allowing greater separation between the engines below. QEC has duplicated main and secondary machinery in two complexes with independent uptakes and downtakes in each of the two islands. The separation provides a measure of redundancy, it increases the chances one propulsion system will remain operational in the event of action damage to the other. Gas turbine engines (situated in the sponsons directly below each island of the QEC) by their nature require larger funnels and downtakes than the diesel engines (in the bottom of the ship). The twin island design helps minimise their impact on the internal layout. In a conventional single-island carrier design, either you have to have a very long island (like the Invincible class) which reduces flight deck space or, the exhaust trunkings have to be channelled up into a smaller space. There are limits to the angles this pipework may take which can affect the space available for the hangar. The uptakes can also create vulnerabilities, the third HMS Ark Royal was lost to a single torpedo hit in 1941, partly due to progressive engine room flooding through funnel uptakes. The twin island design has several other benefits. Wind tunnel testing has proved that the air turbulence over the flight deck caused by the wind and the ship’s movement, is reduced by having two islands instead of one large one. Turbulent air is a hindrance to flight operations and aircraft carrier designers always have to contend with this problem. Twin islands allow greater flight deck area because the combined footprint of the two small islands is less than that of a single larger one. By having two smaller islands it allowed each to be constructed as a single block and then shipped to Rosyth to be lifted onto the hull. The forward island was built in Portsmouth and the aft island built in Glasgow. This arrangement solves another problem by providing good separation for the main radars. The Type 1046 long range air surveillance radar is mounted forward while the Type 997 Artisan 3D medium range radar is aft. Powerful radars, even operating on different frequencies, can cause mutual interference or blind spots if the aerials are mounted too close together. Apart from a slim communications mast, both the Artisan and 1046 have clear, unobstructed arcs. With separate islands it is possible to site the bridge further forward than in a conventional single-island design. This gives the officer of the watch (OOW) a better view of the bows and what is immediately ahead, especially useful when in confined waters. The QEC bridge is spacious and has very large windows with a wide field of view, similar to the Type 45 destroyers. Carpeted with a dark blue-grey finish and wooden trim around the control panels, it has a very different feel to the cream and pale grey interior of preceding Invincible class carriers. The QEC are fitted with a state of the art Sperry Marine Integrated Navigation Bridge System (INBS) including the Naval Electronic Chart Display and Information System (ECDIS-N). The captain has a day cabin just behind the bridge for use at sea but as is usual on a carrier, his spacious main cabin is down aft with the other officer accommodation. There is a small lift that allows him to quickly get up or down from the bridge to the operations room which is situated seven decks below. Like the Invincible class, the QEC has facilities for the Admiral commanding the carrier group and has use of his own ‘flag bridge’ below the main navigation bridge. It offers a good view and a useful space for his staff, away from the ship’s personnel. When no admiral is embarked, the flag bridge is available for the ship to use and is a convenient place for meetings and to entertain guests. Note the circular wooden table, inlaid with the ship’s crest. US Navy photo. The steering position on the bridge of fifth HMS Ark Royal seen in 2009, complete with classic chintzy seat cover. The QEC aircraft control position, known as flyco is a major change in design philosophy. Instead of being just an appendage to the navigation bridge it has been designed in partnership with Tex ATC Ltd, one of the world’s leading providers of military and civilian airfield control towers. By siting the Flyco separately, it can be positioned in the optimum place to view aircraft as they approach the ship for landing. This is the moment when the pilot requires most help from the ship and a dedicated aircraft controller sitting in Flyco (usually a former pilot) can help talk the plane down if needed. The QEC flyco projects out from the aft island and has enormous 3-metre tall windows with providing a 290º view over the flight deck. Such tall windows allow a good view of high flying aircraft for all, including for the personnel sitting in the small raised gallery at the back of the Flyco. In some older ships, the cramped flyco position looked like an afterthought it was sometimes necessary to get right up close to the small windows to see high flying aircraft. The 3 metre high, multi-layered armoured glass panels are slightly tinted for protection against glare and are strong enough to withstand a direct hit from the rotating blade of a Chinook helicopter. Flyco can issue instructions to the aircraft handlers on the flight deck via their headsets or using large LED displays mounted on the side of the aft island. It is also connected to the hangar control room below where orders are issued to prepare aircraft to be brought on deck. The Commander Air, “Wings” gets a day cabin in the aft island but does not have his own lift, like the Captain up forward. The aft island also features a ‘bridge’ which has replica ship controls and, in the event of damage to the forward island, could be used as the emergency conning position. The new Project 23000E “Shtorm” concept from the Russian Krylov State Research Center (KSRC) for a 95,000 ton conventionally-powered aircraft carrier has copied the twin island design. Shtorm is a Putin fantasy, unlikely ever to be realised as Russia has not managed to build a surface ship larger than a frigate since the 1990s. Italy is also building a new LHD ‘flat top’ with twin islands. For aircraft carrier veterans the completely separated bridge and flyco will take some adjustment. Because the ship’s course and speed need to be carefully coordinated with flying operations, the close proximity of the OOW to the flight controllers helped them work together. In the new arrangement, they will not be able to see each other and are reliant on the intercom. No doubt everyone will quickly adapt and the benefits of additional space for both navigators and flight controllers will outweigh any disadvantages. It is highly subjective, but some carrier ‘purists’ have said the twin islands make the QEC look “ugly”. Others see the QEC as quite beautiful and despite their quite angular shapes, represent just another step in the evolution of carrier design appropriate for the 21st Century. The QEC will benefit from a ski-ramp to assist aircraft on take off and twin islands, both of which were invented by the RN. It is encouraging to see the RN retaining its place at the forefront of aircraft carrier innovation. I think the design is very elegant, and I hope highly efficient, but I don’t understand the very flat, flush nature of the ship’s bows. To me it seems the least streamlined option, presenting a flat block to the oncoming air stream… can any one explain the thinking. I too find this strange. A more streamlined bow would not only create a more aerodynamic design, it would also allow a longer runway – thus freeing up even more deck space. Curious. I suspect it would have something to do with the thickness of the flight deck, but that’s just a guess. American aircraft carriers have an auxiliary bridge under the extreme forward edge of the flight deck that would be used in the event the bridge in the superstructure was rendered unserviceable by combat damage. I’m not sure if the USS Ford has this feature but certainly earlier carrier classes did. You can see the small bridge portholes under the bow round down. Also, on American carriers everything above the hanger deck is considered to be “superstructure”. The hanger is not part of the hull as was the traditional practice of Royal Navy carriers. The thought here is that a hanger fire does not affect hull integrity and older US carriers had huge roll up doors to allow smoke filled hanger to be aired out by simply opening up the roll up doors. A superstructure hanger also doesn’t present the flooding risk present in the old bi-level British design. Today the big elevator doors perform the hanger ventilation function. Also unlike traditional RN carriers, there is a full height working deck between the flight and hanger decks on American carriers (Russian and Chinese carriers too). The air wing lives and works in this space. The Essex Class were the first carriers to incorporate this feature, done to absorb some energy from bomb hits and prevent them from penetrating armored decks of the hanger. For the most part that worked as the Essex class proved capable of absorbing enormous battle damage without sinking and many times without even losing power. The “hurricane bow” was also a British invention. The original Essex carriers had open bows some of which were replaced by enclosed bows during reconstruction during the 1950’s. As far as absorbing battle damage no Essex was ever seriously challenged except for single hits by lightweight torpedoes with most damage caused by kamikaze attacks to the superstructure not the hull. An attack like those against Lexington (which had better protection” or Yorktown would have sunk an Essex just as well. Check out photos of USS Franklin and USS Bunker Hill. Even destroyers were able to survive multiple hits so that should surprise. You might also check the Vietnam era photos of USS Forrestal which lost pilots who were trapped in their ready room, Oriskany (a modified Essex) and Enterprise which were all seriously damaged in accidents. Roll up doors would probably be a liability a fallout contaminated conflict. Obviously if the ship itself is hit it may not be an issue! Open hangars were preferred to allow engine runups prior to delivery to the flight deck. The “full height” hangAr on Essex was originally Two (2) separate hangars which were combined into one postwar during the same reconstructions as when the Hurricane bows were added. The RN did the same with HMS Victorious and and others would have followed if not for budgetary cutbacks. The reason was that there was insufficient clear height for the propellers of larger aircraft coming into service. Good read but I think you are incorrect in saying that the aft tower of the new Italian LHD contains only the funnel. As could be spot from many design models of the Trieste , the aft island hold both a radar as well as an air traffic control tower. Apologies, now amended, was looking at an early iteration of the design. Best article I have read on the topic. Thanks. 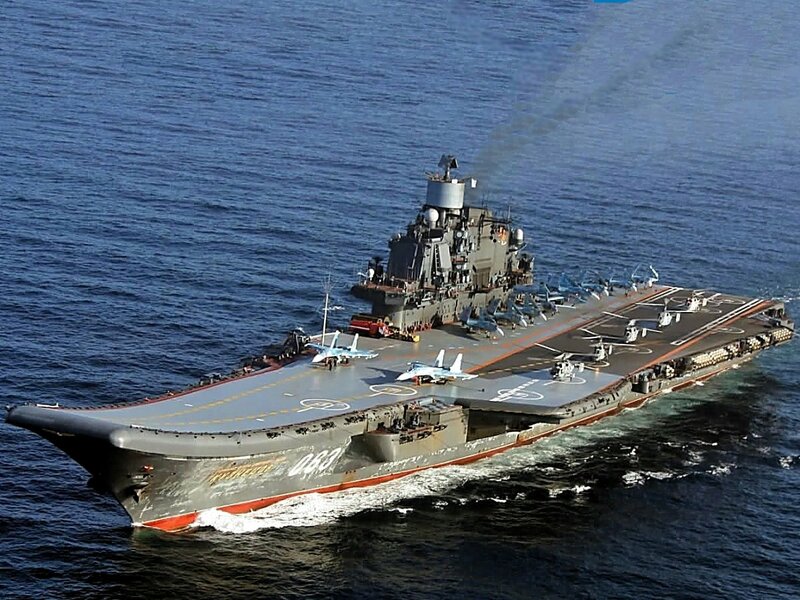 One point about the Russian carrier: is that two ski jumps? Looks like a good idea. Is that something which could reasonably have been done on the QE Class? Not sure, the angled flight deck doesn’t look like it has enough of a angle to really be a ski jump. But what the Russians did do with even their old Kusnetzov carriers was create a ski jump that effectively enabled two aircraft to take off in quick succession. I feel like we missed a trick there. The angled deck on the Kuznetsov is dead flat. Only the bow has a ski jump. The lack of catapults on Kuznetsov and similar STOBAR carriers severely limits the fuel and ordnance their air wing can carry into combat, greatly limiting their tactical usefulness. The QE is a much better design with a much better combat aircraft. The F-35B is going to launch from the QE class with more fuel and weapons than the Flanker the Russians or Chinese fly from their carriers. James was talking about the Project 23000E “Shtorm” not the Kuznetsov. The point I was making was the the Kuznetsovs sky ramp is made wide enough to allow more launches in a shorter time period than the QE’s which looks like it has only one run way position, which as I said, seems to be a trick we missed. with the two Flankers in the two runway positions ready to be launched. I still question the lack of an angled deck. I would have though if the brakes fail on landing an F35 should have the option of going round again rather than piling into parked aircraft or one waiting to take off the ramp. The ship is so long i would have thought an adequately powered STOL a/c could land and take off with relative safety. Swordfish anyone?! Both the Harrier and the F-35 establish a stable hover alongside the port side of the ship then slide sideways over the landing spot. They land vertically with the brakes already set. There are endless videos of British, USMC and Italian Harriers landing this way on their respective navies VSTOL carriers. an f35 can land vertically will they do a conventional rolling landing ? so is this not a concern? I think you may have missed some of the points here. The QE class were designed, built and optimized from day one specifically to operate the F35B. Because of this the QE’s have the longest carrier runway in the world in order to maximise the length of the F35B’s non-catapult take offs and non-trap rolling landings which in turn maximises their take off/landing weights by having the F35B start their take off and rolling landing runs from the stern. Angled runways just shorten the runway to accommodate catapult launch areas which are not required so aircraft are not generally parked on/in line with the runway but I do agree that crossing the runway will require strict supervision. Another important benefit from the single long runways is that it can make for a significant increases in the speed of take offs and/or landings as there Is little or no waiting time for the catapult/traps to be setup/reactivated which also leads to a reduction in the carrier’s flight deck crew requirements. A very interesting article. While the 3 meter Windows in Flyco offer a splendid view, I would feel somewhat vulnerable in there during a combat scenario where anti- ship missles are inbound. A great capability but not all of it was thought through. The LSO for example, sits in the tower rather than on a platform which is great when the meatball is colocated. In this case, there is no meatball with landing aids similar to a PAPI on land which creates parallax errors for LSO. All this is now sorted using technology but at additional expense. The moral is change is good and technology allows us to progress, but let’s not forget the fundamentals and ensure we get it right from the outset. Well, the British gave us “steel flight decks” and the canted deck that all our carriers use to day…….So will we see dual islands in the future on US carriers?? ?…..we’ll see!……..
And the Mirror Landing System! Which we seem to have forgotten about the advantages of since being forced down the Through Deck Cruiser route…. I still believe that we would have been better off with a more flexible ‘traditional’ carrier with angled deck and cats. Would still be able to launch F35’s, but could also accept USN aircraft in emergency – or buy F18’s if needed and COD aircraft…. The QE’s are great ships, but not the most flexible for air ops. Too expensive unfortunately – these 2 carriers have bankrupt the Royal Navy budget – hence only 6x Type 45 destroyers, when we really should have had 12 to replace the Type 42 destroyers! 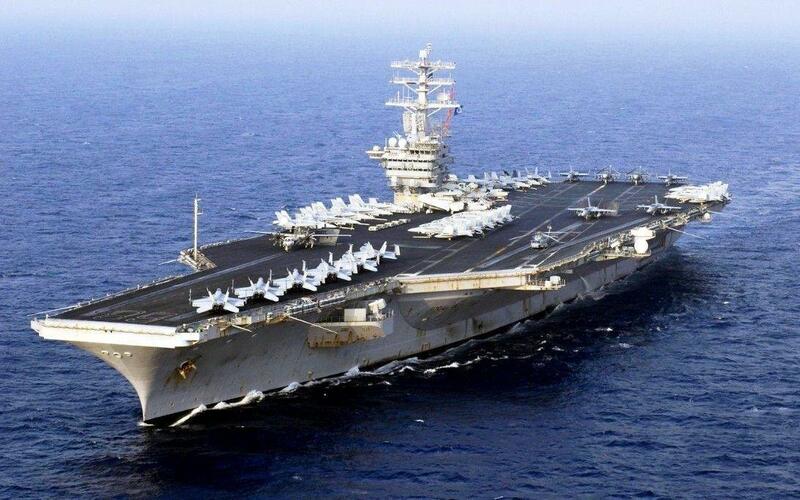 How about you just make a nuclear powered carrier like the French and US, and get a catapult launch system so you don’t have to have that ridiculous ramp. I’m glad this ship is finally in service. Hope people give the ship a chance to work out the bugs all new classes of ships always have. The two island concept isn’t bad, its just different. I can definitely see the benefits but only by actually using the ship operationally can everything be verified.